Chilford Hall Vineyard and Conference Centre is one of the largest dedicated events venues in Eastern England and provides a perfect setting for everything from corporate functions and conferences to weddings and wine tastings. Set in 40 acres of rolling Cambridgeshire countryside, it has been the Alper family home since 1965. An ambitious building and restoration project has transformed it into one of East Anglia's leading conference and banqueting centres. 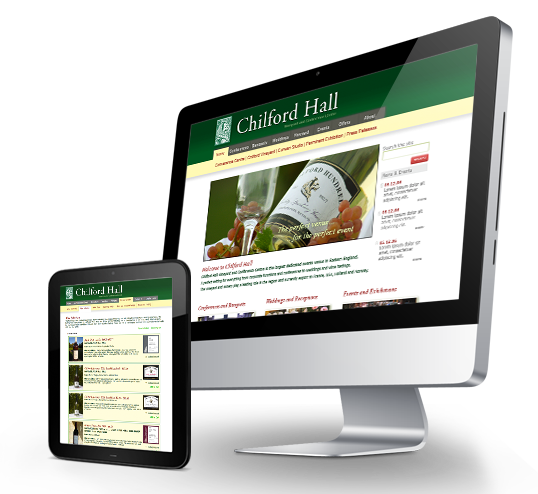 The new website allows staff to update the page information, press announcements, exhibitions and events on the website - keeping patrons abreast of what's happening at Chilford Hall. The interactive map uses the latest Google Maps API technology to provide location, surroundings and directions. The on-line store sells bottled wine made on-site at the internationally famous Chilford Hall Vineyard. Flash-free animation techniques add some dynamics without reducing the audience that can view the website. Web Visual Design, Web Development, Content Management (CMS), Animation, E-commerce, Hosting, Email.